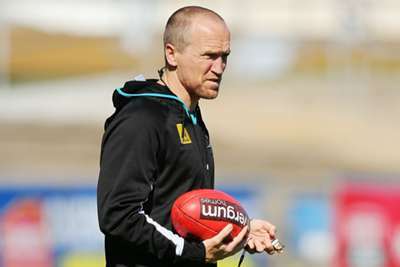 Highly rated fitness expert Darren Burgess is set to join Arsenal from AFL team Port Adelaide. Burgess, who previously worked as Liverpool's head of conditioning, was "handpicked" by Arsenal manager Arsene Wenger, according to the South Australian Aussie rules side. Such is the esteem in which Port hold Burgess, he will be allowed by the Gunners to continue working with the AFL franchise throughout the coming months, including the planning and implementation of the next pre-season, as well as "daily remote consultation" with the remaining backroom staff. "The opportunity to return to the English Premier League and work at one of the world's most successful sporting organisations in Arsenal is an opportunity I simply couldn't refuse," he said in a statement on the Port website. We've agreed to terms that will see Darren Burgess join Arsenal. It remains to be seen if the influence of Burgess, who worked with Australia at the World Cup in 2010, can help Wenger keep his key players fit and in peak condition as they seek to return to the Premier League's top four, having missed out on Champions League qualification by finishing fifth last season. The Frenchman is likely to remain under heavy pressure to deliver, despite having agreed a new two-year contract at Emirates Stadium amid calls from some supporters for the 67-year-old to step down.